Russian separatists ride sit on a tank in the eastern Ukrainian city of Donetsk on February 15, 2015. Shelling and mortar fire thundered around a flashpoint east Ukraine town on February 15 despite a new, shaky ceasefire largely observed along the rest of the frontline separating Ukrainian forces and pro-Russian separatists. The Kremlin-backed separatist appear to be trying to add conditions, after and in addition to the Minsk II ceasefire deal reached on Feb. 12. The first condition seems to be that they are allowed to take the strategic city of Debaltseve, a railway hub between Donetsk and Luhansk. Press reports over the weekend suggested that Russian President Vladimir Putin demanded the city's surrender as a condition at Minsk, but Merkel threatened to walk out of talks unless Putin pulled back this demand. He seemed to, but over the days leading up to the ceasefire on Feb. 14, and afterwards, there appears to have been an intensive Russian-backed operation to take the city. 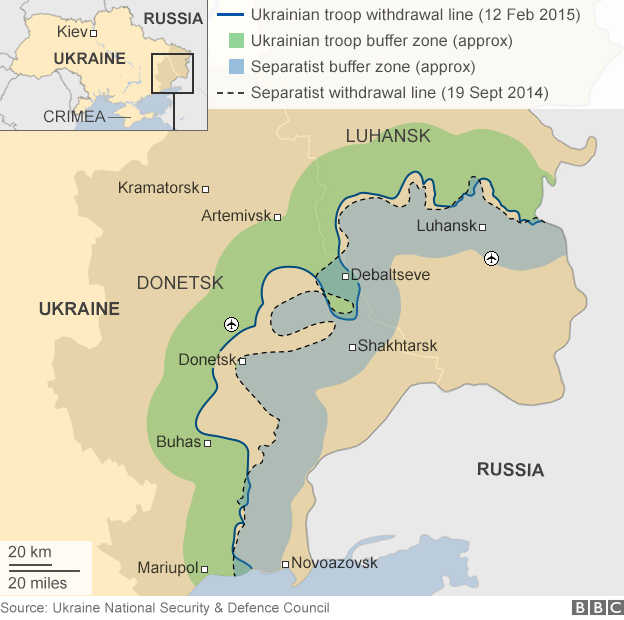 This appears to have failed - with several thousand Ukrainian troops holed up there, but surrounded. Debaltseve appears to be assuming the same psychological significance as did Donetsk airport, until it finally fell to rebels a few weeks back. Debaltseve is important given the strategic transport links which run closely and are important to supply key industrial enterprises still in Ukrainian government hands and in making the separatist enclaves congruent and possibly sustainable as independent entities from Ukraine. Note that the Organization for Security and Cooperation in Europe observers have been trying to access the city but have been turned back by the separatists. The second condition is non-aligned status for Ukraine. And therein likely is the prime reason for Russian intervention in Ukraine over the past year and beyond, i.e., to determine and shape Ukraine's geopolitical orientation. I think that this will be resisted still by Kyiv. Evidently this demand also failed to be delivered at Minsk, but is now seen as a topic for "afters" by rebels and their supporters in Russia. All the above will likely strain the ceasefire agreement which, with the exception of Debaltseve, appears to be holding. That said, the battle over Debaltseve, seems to be following a similar script to that of Donetsk airport after the Minsk I ceasefire, i.e., with Russian-backed separatists eager still to keep a "hot" conflict running at key points along the zone of conflict and therein still useful for securing additional concessions from Kyiv. Timothy Ash is the head of emerging market research for Standard Bank in London. Ukrainian servicemen ride on a tank along a road from Artemivsk to Debaltseve on Feb. 15, 2015. Donetsk (Ukraine) (AFP) - A shaky new truce in Ukraine was already at risk on its second day Monday as Kiev said there was "no question" of its troops pulling back heavy weapons, and the EU ratcheted up sanctions on Russia. "There is no question at the moment of us withdrawing heavy weapons" from the frontline because of persistent attacks by pro-Russian rebels, a Ukrainian military spokesman, Vladyslav Seleznyov, told AFP. Pulling back tanks, artillery and rockets from the frontline in Ukraine's east is meant to take place from midnight (2200 GMT) on Monday as the second phase of a European-mediated truce agreed last week. But while OSCE monitors said the ceasefire that came into effect on Sunday was being generally followed, shelling was unabated around Debaltseve, a strategic railway hub linking the two main rebel-held cities of Donestk and Lugansk. Thousands of government troops are in the hotspot town, mostly surrounded by pro-Russian separatists, some of whom have told AFP they were waiting for an order to take Debaltseve. The situation around Debaltseve remains "dynamic" after troops repelled several rebel assaults, Seleznyov told a Kiev media conference on Monday. The separatists early Monday "resumed shelling" and destroyed Debaltseve's police station without causing any casualties, a regional government official, Vyacheslav Abroskin, said on his Facebook page. Journalists were unable to safely access the town to verify the claims. Monitors from the Organization for Security and Cooperation in Europe (OSCE) had observed shelling around Debaltseve on Sunday but were barred access by rebels. "We plan to go to Debaltseve today (Monday), but that depends on several factors," a member of the OSCE team, Iryna Gudyma, told AFP by telephone. "We cannot risk the lives of our observers." While tensions rose on the ground, the European Union upped the ante on the diplomatic front, adding two Russian deputy defence ministers, Anatoly Antonov and Arkady Bakhin, to its travel-ban and asset-freeze blacklist for allegedly sending Russian troops and materiel in to Ukraine to support the insurgency. Russia has denied repeated allegations it has sent troops and tanks to support the pro-Russian rebels. The West, though, has imposed sanctions that, along with the sharp decline in oil prices, are accelerating the Russian economy's slide into recession. Russian President Vladimir Putin has said he has committed to the peace deal that ultimately aims to end the bitter Ukraine conflict that has claimed more than 5,000 lives since it started in April last year, and has sent East-West relations to lows not seen since the Cold War. Separatists on Sunday told AFP they believed the ceasefire was just a pause, and that they would soon be ordered to launch an offensive to take the town. Despite the collapse of a similar ceasefire agreed back in September, and deep mistrust between the West and Russia, there is international investment in seeing this latest peace effort take root. German Chancellor Angela Merkel and French President Francois Hollande mediated the truce in marathon talks in Belarus last Wednesday and Thursday. On Sunday, Hollande said after a follow-up phone call with Merkel, Russian President Vladimir Putin and Ukrainian President Petro Poroshenko that adherence to the ceasefire was "generally satisfactory" despite some "local incidents". The UN Security Council was meant late Sunday to have met to seek a way to reinforce the Ukraine peace process. But Britain's ambassador to the UN, Mark Lyall Grant said that while consultations would happen, the body was not yet ready to adopt a resolution on the truce. A spokesman for UN Secretary-General Ban Ki-moon said the ceasefire represented "a desperately needed respite" but noted "serious concerns" remained over the situation in Debaltseve.